Sean Anglum: Leaping to the Rescue! The Wyoming Toad Project – Wyoming toads are the only North American amphibians listed as extinct in the wild. Found only in the 50 sq.mi. area of the Laramie Basin in Wyoming, these toads began a rapid decline in the 1970’s due to pollution, pesticide runoff, habitat destruction and fungal disease. In 1988, a few toads were caught and a captive breeding program started to protect against extinction. Cheyenne Mountain Zoo cares for a collection of these critically endangered toads in our off-exhibit Amphibian Conservation Center. In 2008 our toads produced over 3,000 tadpoles! 2,500 of those were released back into the wild. We are currently releasing tadpoles into the Laramie Basin and participating in survey studies to determine their population in the wild. The Boreal Toad Project – Boreal toads are Colorado’s only Alpine toad and live above 8,000 feet. The populations located in the southern Rocky Mountains have experienced dramatic population declines over the past two decades from infection by the chytrid fungus, Batrachochytrium dendrobatidis. Cheyenne Mountain Zoo holds a captive population of Boreal toads in our Amphibian Conservation Center for scientific research. We have participated in a throat pattern identification study and are planning to conduct a health evaluation regarding diet and water quality, and the effect it has on spinal related deformities. Both of these studies help field biologists with boreal toads in the wild. 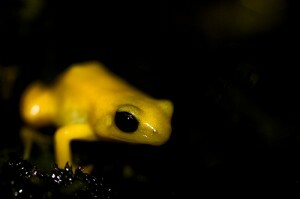 Conserving Mantella Frogs – There are five critically endangered Mantella frogs, native only to Madagascar, that are being over-collected for the pet trade. Habitat loss and disease also threaten the survival of those still in the wild. Cheyenne Mountain Zoo has obtained a collection of Mantella frogs from a trusted captive breeding source and is now captive breeding mantilla frogs to support other AZA institutions and help avoid the collection of wild mantilla frogs in the future. In 2008-2009, the Zoo’s Quarter’s for Conservation program also supported Madagasikara Voakajy, a conservation and research program in Madagascar, which aims to protect Mantella frogs and their habitat through local community education. Cheyenne Mountain Zoo staff also developed a flash card game to help schools in Madagascar teach about their local frogs and the challenges they face in the wild. Through our support they will further their efforts in field research and community education. This entry was posted in Partner project and tagged Cheyenne Mountain Zoo, Conservation by admin. Bookmark the permalink.